Investing in high-quality house siding, seamless gutters, and other maintenance-free home improvement products from ABC Seamless of Albuquerque is one of the best decisions you can make to ensure that your most valuable investment is safe and well-protected. We offer a wide range of durable products specifically designed to help your home withstand New Mexico’s sometimes harsh weather conditions. In fact, all the products we offer, from siding and soffit and fascia to rain gutters and patio covers, will provide you with peace of mind knowing that they are engineered to last. And, in addition to tremendous strength, these products offer outstanding aesthetic appeal, so you can positively enhance the look of your residence’s exterior at the same time. At ABC Seamless of Albuquerque, we are committed to serving local homeowners by offering and installing a wide range of exceptional home improvement products. Our seamless steel siding, gutters, downspouts and collectors, parapet cap flashings, and other home improvement products require no upkeep and offer superior protection from wind, rain, high temperatures, and other elements. 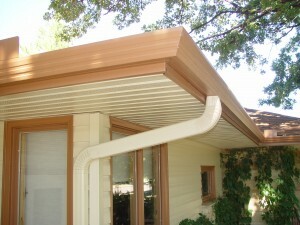 Plus, we offer patio covers to provide shaded outdoor living areas, gutter guards to keep airborne debris from clogging your gutter system, and rain barrel products to collect precious rain water and provide you with a green alternative to landscape maintenance at your Albuquerque, NM, area home. Additionally, because we don’t hire subcontractors, you can be sure your home improvement project is in good hands, with professionals who will arrive on time at your home to offer polite, courteous service. Our employees are all background checked and drug screened, and dedicated to delivering exceptional workmanship, so you can be confident that our technicians are trustworthy and safe, and will work hard to ensure that you are completely satisfied with our performance. Furthermore, we back all of our work with exceptional warranties, so you can be sure your investment is covered, and our A+ rating from the Better Business Bureau is a testament to our commitment to achieving your satisfaction. For more information about durable, seamless house siding, log siding, rain gutters, parapet cap flashings, soffit and fascia, rain barrels, patio covers, and other home improvement products for your residence in Albuquerque, NM, contact ABC Seamless of Albuquerque today. We encourage you to visit our showroom and to schedule a free at-home consultation, and be sure to ask about our convenient financing options, including an offer of zero interest until paid in full.